Parkn Manufacturing (Litchfield, Ohio) knows machine fixture design and how it can be applied to boost quality and productivity. When the company opened its doors in 2005, it encountered fixturing limitations within its commodity vertical machining center, limiting overall throughput capacity. 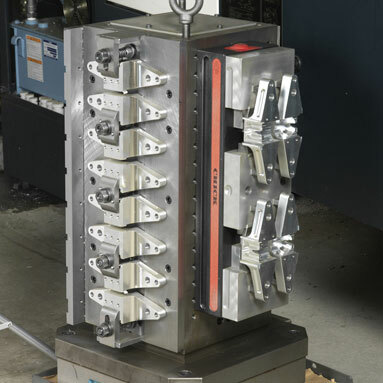 Parkn knew that in order to win large production orders and demonstrate its prowess in machine fixturing, it needed a horizontal machining platform that could achieve precise features using the entire work zone. Parkn understood that in order to obtain the features, performance and recognition it desired, the company would have to invest in a high-performance machining solution. After diligent market research, the company identified the Makino a51 horizontal machining center as the perfect fit for its creative machine fixturing techniques with full availability of the entire machine work zone. Parkn’s employees also attended a programming class at Makino’s Mason, Ohio, facility to support the company in developing effective programs to complement the company’s fixturing techniques. Since investing in the a51, Parkn says that operations that used to take five minutes can now be completed in just one minute. In addition, a part that a competitor machines in 17 minutes can be done in just three minutes at Parkn. The company is finding that it is reducing overall cycle times by as much as 80 percent compared to its previous processes. Parkn uses creative machine fixturing to get as many parts on the tombstone as possible without altering the tool path. Typically, the company can fit six to 10 parts per face of each fixture, with several parts positioned far above the centerline of the work zone. The first application produced on the a51 was an aluminum crossbow riser, featuring critical features on all six sides of the part. A significant factor in the production of these parts is radius cutting speed. While most machines slow down on curvatures, the a51 carries a constant feed rate while maintaining tolerances of plus or minus 0.002 inches or greater across all part features. Additionally, the through-spindle coolant capability of the a51 has provided the company with longer tool life. Tools that were once replaced after completion of three or four parts can now maintain accuracy and consistency through 75 completed parts.